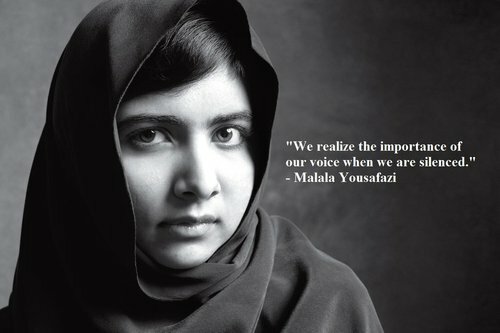 We realize the importance of our voice when we are silenced. I am ready to sacrifice myself, again. I want every girl, every child, to be educated. And that in our whole country for there to be peace. And for peace, I will sacrifice myself. I want every girl, every child to be educated. Today you can see that I am alive. I can speak, I can see you, I can see everyone and … I am getting better day by day. It’s just because of the prayers of people. Because all people – men, women, children – all of them have prayed for me. Today you can see that I’m alive. I can speak, I can see you, I can see everyone and today I can speak and I’m getting better day by day. It’s just because of the prayers of people, and because of these prayers, God has given me this new life, and this is a second life. This is the new life and I want to serve the people. 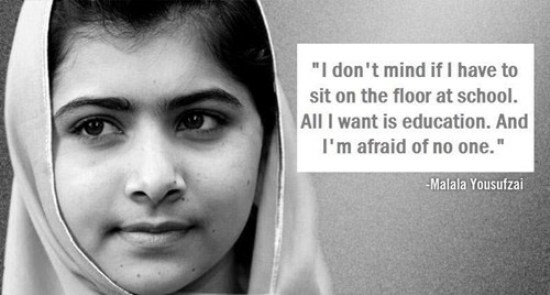 Malala is a brave and courageous girl. People of Swat pay salute to her for her vision. We are proud of her and pray for her good health. God has given second life to my colleague Malala Yousufzai due to the prayers of her supporters and well-wishers. The whole nation including men, women and children are happy with her fast recovery. We are happy that she is getting better day by day. The schoolmates are missing her. Malala?s mother is in constant contact with us. She has told us that Malala will definitely come to Swat soon after complete recovery. Without education no country can make progress. Girls education is the only solution to the present crisis being faced by the nation. I want to serve. I want to serve the people. I want every girl, every child, to be educated. For that reason, we have organised the Malala Fund. Today you can see that I am alive. I can speak, I can see you, I can see everyone. It’s just because of the prayers of people. Because all people — men, women, children — all of them have prayed for me. And because of all these prayers God has given me this new life, a second life. Her medical team decided she was well enough to be discharged as an inpatient. She will now continue her rehabilitation at her family’s temporary home in Birmingham and will visit the hospital occasionally for outpatient appointments. Today you can see that I am alive. I can speak, I can see you, I can see everyone and I am getting better day by day. God has given me this new life – a second life. And I want to serve. I want to serve the people. I want every girl, every child, to be educated.